When photographing outdoors, it is critical to take into consideration the available light (ambient) even when using strobes. 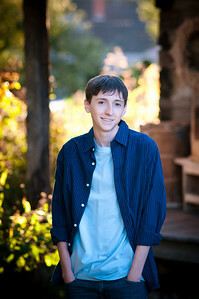 In this photograph, I positioned Cory in the shade but utilized the fast setting sun that was behind him. Since he was in the shade, if I didn't use an alternate light source to light his face, it would have been underexposed. There are multiple ways to obtain the proper exposure on the face (when back lit) and my favorite is to shoot in manual exposure. Although it can seem very daunting at first; shooting in manual exposure isn't as difficult as it was many years ago. Sean's mom held the strobe on a pole camera left. I adjusted the output of the flash to light his face but not overexpose it. I used the Nikon SB800 set to TTL and modified the light output of the flash from the commander mode in the camera. This setting enabled me to dial down the flash output by 1 stop of light. The light from the sun acted as a hair light and gave some separation from the rest of the scene. Get out and enjoy the fun of capturing God's creation!